CRL Launches its new Beta Lab Service for customized transfer solutions. 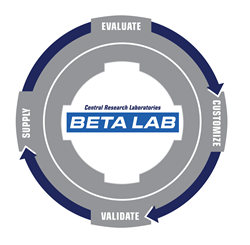 Customers who turn to Beta Lab to develop their perfect transfer solution work hand-in-hand with CRL through a four-step process to reach their goal – Evaluate, Customize, Validate and Supply. Once the process requirements are established, CRL leverages its decades of experience and proven technologies to craft a customized solution. For more information on CRL and its extensive family of remote-handling solutions, please visit crlsolutions.com. Destaco is part of Dover Corporation, a diversified global manufacturer with annual revenue of approximately $7 billion. Dover delivers innovative equipment and components, specialty systems, consumable supplies, software and digital solutions, and support services through three major operating segments: Engineered Systems, Fluids and Refrigeration & Food Equipment. Headquartered in Downers Grove, Illinois.